What I am really fascinated with is, when a certain food has a history behind it. And when I am saying history, I don’t mean my history, but a story that goes back many, many years. As you may or may not know, Greece has been enslaved under Ottoman Empire for 400 years between 1453 when Konstantinople (Istanbul for the Turks) was conquered by Sultan Mehmet II and 1821 when Greeks started their fight against that regime. During these 400 years the dynamics that were created, helped people to survive and maintain their ethnic identity. Roles became ambiguous as everyone was trying to create a life for himself. During that period, Ottoman Empire delegated certain roles to certain people in order to maintain the stability and control of the area. That same time two separate groups formed which, in the beginning, acted against each other; Armatoles and Klephts. The prime were recruited by the Ottoman government to control certain areas of interest delegated to them by the local Ottoman Pashas. These areas were hard to access or had high levels of brigandage. They were carrying guns and tried to maintain the delicate status-quo with the Ottoman authorities. In direct contrast, the Klephts were anti-Ottoman insurgents, who were the descendants of Greeks who retreated into the mountains to avoid Ottoman oppression. At some point and during the Greek revolution the roles of these two separate groups have blurred and both started having a common goal; their country’s freedom. Now, you will ask how all this history is connected to this chicken! I will reply to you that Kleftiko or Klephtiko means the one coming from the Klephts. During those years of oppression and the subsequent ones of the revolution, those people in order not to be discovered they had to invent ways to cook their meals in the mountains. 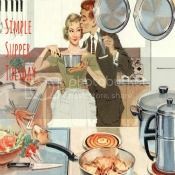 They had to find tricks not only to eliminate any smoke, but also to not be able for anyone to smell the cooking meals. Thus, they cooked their meat, that being lamb back then, in a sealed pit. So, nowadays all meat that is cooked in a sealed parchment paper or in any such manner is called Kleftiko or Klephtiko. This chicken is wrapped in parchment paper and sealed with a thin rope and thus falls under this category. I can tell you that it was amazingly soft and burst with flavors, as all the juices from the chicken and all the liquids I added were surrounding the chicken and kept it very tender. Eventually, ten minutes under the broiler gave the layer of vegetables above the meat the necessary depth of flavor. Cut three pieces of parchment paper big enough to carry a half breast along with the vegetables and liquids and be able to seal it with a thin rope. Take one half breast and place it on the parchment paper. Add the 70 gr. / 3 oz. of feta cheese above each one of them. Divide the vegetables equally among the three pockets starting with the tomato, after add the pepper, next the onion and finishing with the parsley. Divide the sugar equally to all three of them. Without pouring the wine and olive oil and open as they are, squeeze them in a pan very close to each other. Pour the wine and olive oil and seal them with the thin rope. Spray the pockets with water and bake them at the lowest level of your oven for an hour. Open the pockets and place them under the broiler at the medium rack of your oven at 225° C / 437 ° F for about 10 minutes. Now please pay attention, don’t leave the oven unattended as broiler has very high temperature and can burn your meal. Remove and drain the liquids. Place the liquids in a small pot and boil for five minutes. You can thicken this sauce by whisking 1 tbsp of corn flour dissolved in 1 tbsp water into it. Transfer them to a platter and serve pouring the sauce on top of them. Chicken Klephtiko was featured at Hun…What’s for Dinner? Μ’αυτό τον τρόπο το κοτόπουλο γίνεται απίστευτα ζουμερό! Προθερμένετε το φούρνο στους 200° C.
Κόψτε τρία κομμάτια χαρτί ψησίματος αρκετά μεγάλα ώστε να χωράει το καθένα από μισό στήθος με τα λαχανικά του και τα υγρά του και να μπορείτε να το κλείσετε σαν πουγκί. Πάρτε ένα στήθος και βάλτε το στο χαρτί. Κάνετε το ίδιο και με τα υπόλοιπα στήθη. Προσθέστε τα 70 γρ. τυρί φέτα πάνω από κάθε ένα από αυτά. Μοιράστε τα λαχανικά εξίσου ανάμεσα στα τρία πουγκιά ξεκινώντας με την ντομάτα, μετά από προσθέστε την πιπεριά, στη συνέχεια το κρεμμύδι και στο τέλος το μαϊντανό. Ρίξτε τη ζάχαρη εξίσου στα τρία επίσης. Πριν ρίξετε το κρασί και το λάδι, τοποθετήστε τα σε ένα ταψί στρυμωγμένα το ένα δίπλα στο άλλο. Ρίξτε το κρασί και το λάδι και κλείστε τα με το σκοινάκι. Ψεκάστε τα πουγκιά με νερό και ψήστε στο χαμηλότερο επίπεδο του φούρνου σας για μια ώρα. Ανοίξτε τα πουγκιά και τοποθετήστε τα κάτω από το γκριλ στη μεσαία θέση του φούρνου σας στους 225° C για περίπου 10 λεπτά. Προσέξτε, μην αφήσετε το φούρνο χωρίς παρακολούθηση, γιατί το γκριλ έχει πολύ υψηλή θερμοκρασία και μπορεί να κάψει το φαγητό. Βγάλτε από το φούρνο και στραγγίξτε το ζουμάκι σε ένα κατσαρολάκι. Βράστε για πέντε λεπτά και αν θέλετε να πήξετε τη σαλτσούλα προσθέστε 1 κ.σ. κορν φλάουρ διαλυμένο σε 1 κ.σ. νερό και ανακατέψτε. Σερβίρετε σε πιατέλα έχοντας περιχύσει με τη σάλτσα. Wonderful recipe and lovely photos! A perfect way to use fresh summer veggies and herbs from the garden! this recipes suits for my weight issue…..
alternative option for a healty recipe! Great photos & it sounds amazing! I love that you shared the history with it. Thanks for sharing at Sweet & Savory Saturdays #20! I have been to both Greece and Turkey and found a lot of overlap with their cuisines and I never thought about why… thank you. Great looking chicken and welcome, hope to see more of you at foodie friday. What an interesting story of those people having to cook in pits in the mountains to avoid being detected. It is amazing how certain recipes have evolved from hardship and this is a delicious example! This looks great! Thanks for the history lesson – I think the food is way more interesting when you know the story behind it/the “why” of it. This sounds awesome and your photos are beautiful. Thanks for sharing on Foodie Friends Friday! Interesting history behind this dish! Looks delicious & packed with flavors! De esta forma queda estupenda se ve muy exquisita me encanta sus fotos,saludos y abrazos. I just came back from Budapest and we also had a tour with the history and I learned that Hungary was also ruled by the Ottoman Empire for a while! And they also suffered from oppression. This is such a great way to cook chicken, I must try it especially as it looks great for summer! Looks Delcicious! Thank you for linking up at Hickory Trail! Oso gia to fagito….ti na po..to fadazomai psimeno mesa sta ladokolla tryfero kai zoumero!!! such a great cooking technique! This sounds so wonderfully flavorful, I wish I was eating this for dinner tonight! Its always great to know the history behind food. its technique and where it originated. I have prepared fish in paper pockets but never a chicken. I am sure this special technique and the ingredients going into this dish makes it truly delicious! Une histoire très intéressante pour un plat bien délicieux. I love this dish and I especially enjoyed the dash of history on the side. A delicious and interesting recipe. Such light recipes are ideal for summer days and those flavors are so refreshing. So interesting! I can imagine cooking it that way really seals in the flavor. Looks delicious! is so delicious! Have a nice weekend! It looks so delicious – I love recipes where everything is cooked together in the oven. oooh, a history lesson AND an awesome recipe and technique! i love chicken prepared like this–bravo! This looks so delicious. Great flavors! I’ve frequently baked fish in parchment, but never chicken. Probably because I figured it would take so much more time. But with this dish, the extra time is well worth it. Looks wonderful and healthy, Katerina. Loved the history lesson too! Thank you for a little history of Greece. Very interesting! I started cooking in parchment about a year ago and just love it, but I still haven’t tried cooking chicken, or meat for that matter. This dish looks like a perfect recipe to start with! love it! Thanks! Love this dish. So summery and bursting with flavors! Wow, these little packages of chicken really has a long history and story. I don’t think I’ve ever tried a Chicken Klephtiko before but I love parchment packed food. They are so easy to prepare. I love that this one has protean and veggies in them. Plus, they are really a breeze to clean up! 😉 Thank you so much for sharing the recipe and story behind them. What a lovely healthy and light meal. I could eat this all week for lunch! Και ωραίο, και διαιτητικό και υπέροχα παρουσιασμένο! Thanks for the lesson and this great recipe. Also, thank you so much for pointing out that I left the tomato paste off. I remedied that post haste! I have never tried Kleftiko..it certainly looks delicious and healthy as well. How very interesting! And your version is a lot easier than baking in a sealed pit. I bet the flavor is divine! Great history lesson and it is always amazing to see how people adapt to survive…and eat well. The chicken looks lovely. It looks delicious, I would love this for dinner anytime. Katerina, this dish looks lovely and the story you told us makes it even more fascinating. Necessity is the mother of invention! I am bookmarking kleftiko! Thank you for one more inspiration. The chicken looks so yummy and light. I love that it is cooked in these little parcels, really locking in all the juices and flavors of the meat and veggies. It’s actually great diet food without compromising on the taste. Cannot wait to try it! I did horrible in history in school (it was all about memorization and no fun)… BUT food and history is always very interesting! And now I’m ready to eat this. These look fabulous! I love reading about the history of foods. Thank you for sharing at Simple Supper Tuesday. I’m like you – I love learning and cooking foods with a rich history or story behind them. The story behind this dish is so interesting! Thank you for sharing some of your country’s history with us. The chicken dish looks wonderful and I bet it’s bursting with flavor! The history behind this is crazy! THanks for sharing! I always liked this dish and the way it is served but this is the first time I read its story! Absolutely delicious my friend and you used the wine from Samos, yay!!! Έφτιαξα πρόσφατα αλλά διαφορετικά λίγο. Ωραία εμφάνιση και παρουσίαση! Τρελαίνομαι για αυτό το πιάτο Κατερίνα μου! Είναι εύκολο, και ο συνδυασμός του κοτόπουλου με τα λαχανικά και τη φέτα, τόσο μα τόσο γευστικός! What an interesting post, Katerina! I loved reading about the history of your beautiful country, and the history behind the cooking method of this dish. Thanks for sharing, and hope you have a good week. Τι ωραία με κοτόπουλο θα τα φτιάξω! !